BarCamp Tema 2013 is a free networking forum bringing people together for a day of discussion, demos and dialogue on Tema, Ghana and beyond. It takes place on August 10, 2013 at the Rotary Centre in Tema. The theme is “Building new industries for our communities”. This Barcamp will be the 21st organized by the GhanaThink Foundation as it builds a network of young change makers, doers and entrepreneurs in Ghana. It’s being organized in conjunction with the Rotaract Club of Tema. Tema is well known for its music and entertainment stars which is supporting a local music industry. This Barcamp would focus on how to grow more industries for various entreprising communities. The event will be a showcase of how Ghana’s youth are taking charge of its development and how they can be spurred on to do more. There will be a focus on channeling the present energies around entertainment into positive developments and progress for Tema and surrounding areas as well. This initiative hopes to assemble stakeholders to network, build a supportive enterprising community and partner to build together. The Barcamp will feature multiple user-generated breakout sessions about business, social entrepreneurship, technology and development, alongside topics relevant to the Greater Accra Region and beyond. There will be a speed mentoring session where mentors will give insights and answers to questions from attendees. Various Tema leaders will be on a panel that will center on the theme. Confirmed resource personnel include Ali Maiga, Caroline Sampson, Benjamin Aggrey, Ob Abenser, Pascaline Edwards, Ali Maiga, Nana Kofi Asihene, Gregory Rockson, Nana Asaase, Doreen Andoh, amongst others. Register/RSVP at the BarCamp Tema eventbrite website (barcamptema13.eventbrite.com) or text “Barcamp Tema [name] [email address] to 1945 through any mobile network.. You may also contact the BarCamp Tema team through the eventbrite page for sponsorship opportunities. If you are interested in organizing a breakout session, let us know, especially if you have special needs. BarCamp Tema 2013 is sponsored by GhanaThink Foundation, Rotaract Club of Tema, Nandimobile, etc. Our media partners are the Ghana News Agency. Join us to move the Greater Accra Region and Ghana forward. Stay tuned via our social media. Behind closed doors, your brand precedes your value. In recent years Personal Branding has become a major topic of discussion and attraction for entrepreneurs, businesses and job seekers. Its benefits are gargantuan. 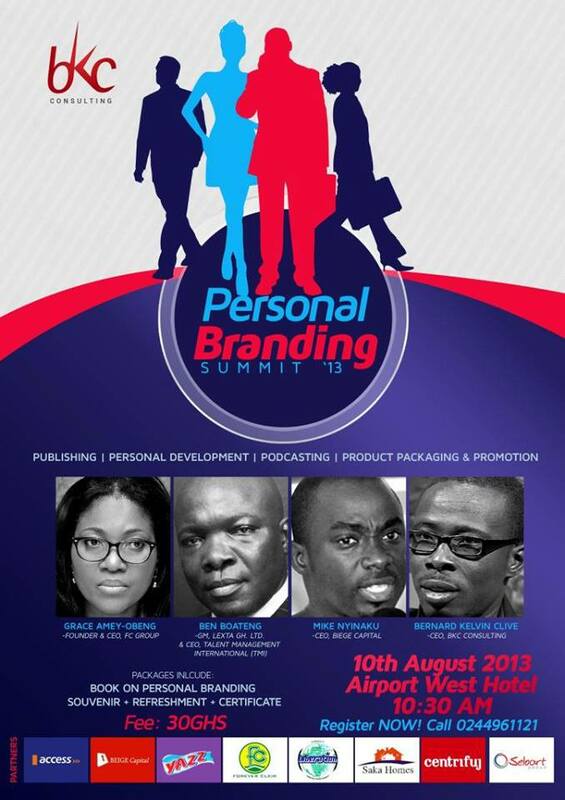 In the quest to educate and empower more individuals and corporations in that area, BKC Consulting, a professional and personal development consulting company, primarily known for their training workshops such as ‘e-Publishing’ and ‘Social Media Branding’ is organizing the first ever annual flagship event “Personal Branding Summit®” in Accra, Ghana. To be held on August 10th, 2013, 10:30 AM at the Airport West Hotel, Accra. The summit’s goal is to fully equip participants on the essence of personal branding in this era, for personal and professional development. The event will enable participants to utilize available mediums such as social media networking, formal and informal interaction to grow their career aspirations. For graduate students, this will equip them in building a great personal brand for career search, using social media, blog, brand management and reputation. Reinvent themselves at any stage of their lives. Make their brand go viral. Discover the critical skills they need to succeed at work and social media skills for career success. Maintain your reputation and credibility in business. Topic: Social Media Branding/e-Publishing revolution. Presentations by Tina Kyei of Wining Branding Media, UK on “Internet Marketing & Brands”, Alberta Quarcoo of EtiquettePlus on “Manners Matter”. Event partners: FC Skin & Beauty Klinic, Access Bank, Saka Homes, Beige Capital Ltd., DreamHub Consult, Centrifuj, Woman 2.1 Summit, Motivational Speakers Network , Liberation Consult Ltd. Selort Group. GCEEI, EnewsGh, Dreametrix Ltd., EwatchMagazine, Radio XYZ, TV3, GTV. THREE REASONS WHY THE “YOUTH ARE NOT THE LEADERS OF THE FUTURE”. THREE REASONS WHY THE “YOUTH ARE NOT THE LEADERS OF THE FUTURE”.. The youth are easily to influence because they easily understand issues. They are the largest in terms of population ans so they are the best target to work with. They are the “leaders of the future”. Our tutor told us to think about the third point which states that the “Youth are the Leaders of the Future”. At the end of the discussion we disagreed with the statement. 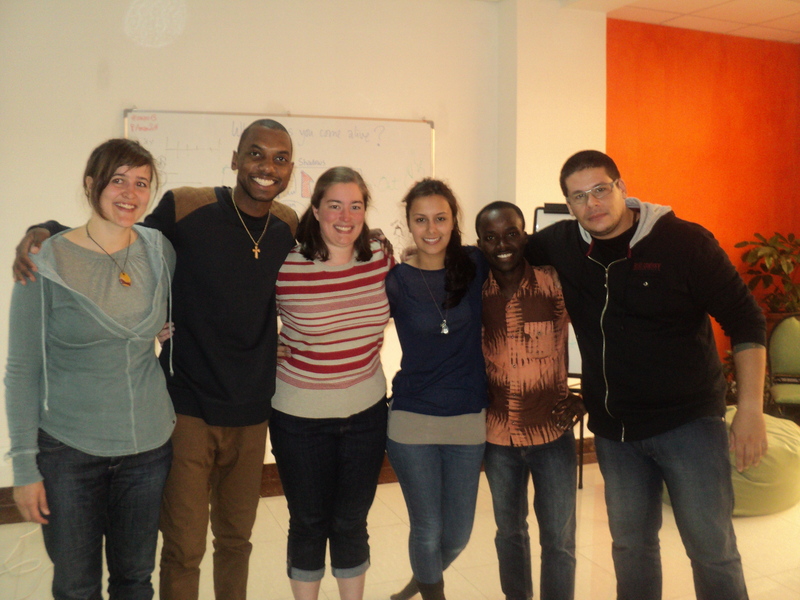 We believed that the youth are the leaders of now! I will share with you briefly the three reasons why the youth are not the leaders of the future. We are the leaders of today: How do you define a leader in the context of age? Anybody can be a leader irrespective of the age. The innovative things we see happening in the world are done by young people below the age of 30 years. The youth need to know that, they need not to waste 20 years of their time to be leaders, but they need to have a mindset to understand that as young as they are they can cause an influence in the world they find themselves in. The youth are capable to act now! The youth have the expertise to cause change now than later. The most advanced progress made in our world today are all powered by the creative minds of the youth. Age does not determine creative thinking even though it does suggest experience. Barcamp Tamale 2013 is a free networking forum bringing people together for a day of discussion, demos and dialogue on Tamale, Ghana and beyond. It will take place on August 17, 2013 at Tamale Polytechnic. The theme for this year is yet to be determined. This Barcamp hopes to assemble stakeholders to network, build a supportive enterprising community and partner to build together. The GhanaThink Foundation has successfully organized 20 BarCamps in Ghana. BarCamp Tamale 2013 will be a showcase of how Ghana’s youth are taking charge of its development and how they can be spurred on to do more. There will be a focus on channeling the present energies around entertainment into positive developments and progress for Tamale and surrounding areas as well. The Barcamp will feature multiple user-generated breakout sessions about business, social entrepreneurship, technology and development, alongside topics relevant to the Northern Region and beyond. There will be a speed mentoring session where mentors will give insights and answers to questions from attendees. Various Tamale leaders will be on a panel that will center on the theme. Register/RSVP at the BarCamp Tamale eventbrite website (barcamptamale13.eventbrite.com) or text “Barcamp Tamale [name] [email address] to 1945 through any mobile network.. You may also contact the BarCamp Tamale team through the eventbrite page for sponsorship opportunities. If you are interested in organizing a breakout session, let us know, especially if you have special needs. BarCamp Tamale 2013 is sponsored by GhanaThink Foundation, Nandimobile, etc. Our media partners are the Ghana News Agency. Join us to move the Northern Region and Ghana forward. Barcamp Ho 2013 is a free networking forum bringing people together for a day of discussion, demos and dialogue on Ho, Ghana and beyond. It will take place on October 26, 2013 at the SRC Auditorium of Ho Polytechnic. The theme for this year is yet to be determined. This Barcamp hopes to assemble stakeholders to network, build a supportive enterprising community and partner to build together. The GhanaThink Foundation has successfully organized 20 BarCamps in Ghana. BarCamp Ho 2013 will be a showcase of how Ghana’s youth are taking charge of its development and how they can be spurred on to do more. There will be a focus on channeling the present energies around entertainment into positive developments and progress for Ho and surrounding areas as well. The Barcamp will feature multiple user-generated breakout sessions about business, social entrepreneurship, technology and development, alongside topics relevant to the Volta Region and beyond. There will be a speed mentoring session where mentors will give insights and answers to questions from attendees. Various Ho leaders will be on a panel that will center on the theme. Register/RSVP at the BarCamp Ho eventbrite website (barcampho13.eventbrite.com) or text “Barcamp Ho [name] [email address] to 1945 through any mobile network.. You may also contact the BarCamp Ho team through the eventbrite page for sponsorship opportunities. If you are interested in organizing a breakout session, let us know, especially if you have special needs. BarCamp Ho 2013 is sponsored by GhanaThink Foundation, Nandimobile, etc. Our media partners are the Ghana News Agency. Join us to move the Volta Region and Ghana forward.